A high-tech, sophisticated super automatic coffee machine from Gaggia, this model is remarkably affordable at $799. Its blue LCD screen makes programming the coffee settings easy to understand. The control panel looks overwhelming at first with a long row of buttons, but figuring out the controls doesn’t take very long. The coffee it produces is rich and fresh, and you don’t have to wait long for the steam to power the froth wand. We like being able to choose the fineness of the coffee grinds. 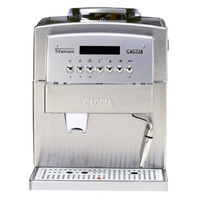 With an efficient operation and delicious results, this Gaggia model is a great entry-level super automatic machine.